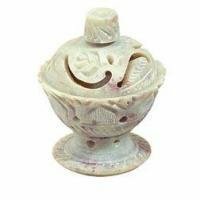 Hand Carved Soapstone cone & stick incense holder. Turn lid of cone box upside-down to burn incense sticks Handcrafted in India. H 2.5"